A new analysis shows that Amazon's Appstore for Android is a far more profitable avenue for developers on an active-user basis than Google Play, though Apple's iOS App Store remains the market leader. Analytics firm Flurry revealed in a new blog post on Friday that Amazon's competing Android Appstore is much better at generating revenue from mobile applications than Google's own first-party Android market, which is now under the Google Play umbrella. Because Apple is the market leader, Flurry set Apple's App Store revenue at a value of 100 percent. The figures from a number of leading, cross-platform applications also available on the Amazon Appstore and Google Play were then compared to Apple's App Store. In this normalized comparison, Amazon's Appstore made 89 percent of the revenue that the same software did on Apple's App Store on an active-user basis, while Google Play made just 23 percent. 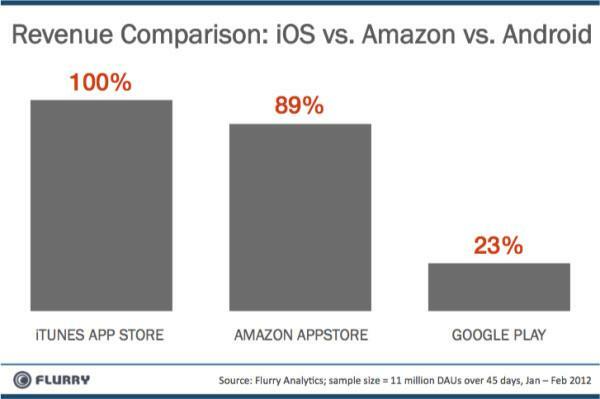 In other words, for every dollar in revenue generated from Apple's iOS App Store, the Amazon Appstore for Android brings in 89 cents per active user, while Google Play earns 23 cents for software available at all three storefronts. The applications included in the comparison make most of their money from in-app purchases, which was the revenue type compared in the analysis. "Amazon, who forked Android in order to put customers into their own shopping experience on the Kindle Fire, is showing its commerce strength, already delivering more than three times the revenue in its app store compared to what Google delivers developers," Flurry's Peter Farago wrote. The statistics come from 11 million daily active users of top-ranked applications available on iOS, Amazon and Android. They were measured over a 45-day period, between January and February of 2012. Flurry's statistics are only the latest evidence of Google's struggles to command the kind of revenue for developers that Apple has seen on its iOS platform. The firm also issued a report in December that showed similar results, with Android earning 24 cents for every dollar earned at Apple's App Store. But the latest figures are the first to also include the Amazon Appstore, and suggest that Amazon has been far more successful at convincing its users to pay for mobile software than Google. Further demonstrating how profitable Apple's iOS platform is, another analysis issued on Thursday revealed that Google earns 80 percent of its mobile revenue from Apple's iPhone and iPad, while just 20 percent of mobile revenue came from its own Android platform.